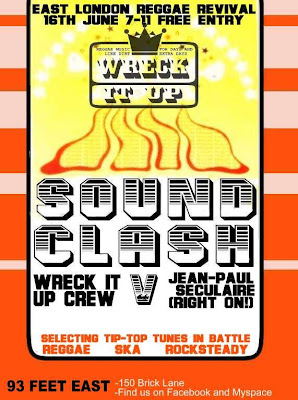 I will be taking part in a "reggae sound clash" style Battle of the DJs on Wednesday16th June, 2010. This one-off, special, FREE event sees me take on the precocious young WRECK IT UP! crew (Eli and Renata) on their home turf - 93 Feet East's pink bar in Brick Lane (opposite The Vibe Bar where I used to run Chick-A-Boom). Expect some seriously big tunes, rewinds and version galore, with Eli and myself battling on the mic. foundation BLUES and SOUL, shuffling SKA, swinging ROCKSTEADY, and of course, stomping, funky REGGAE. 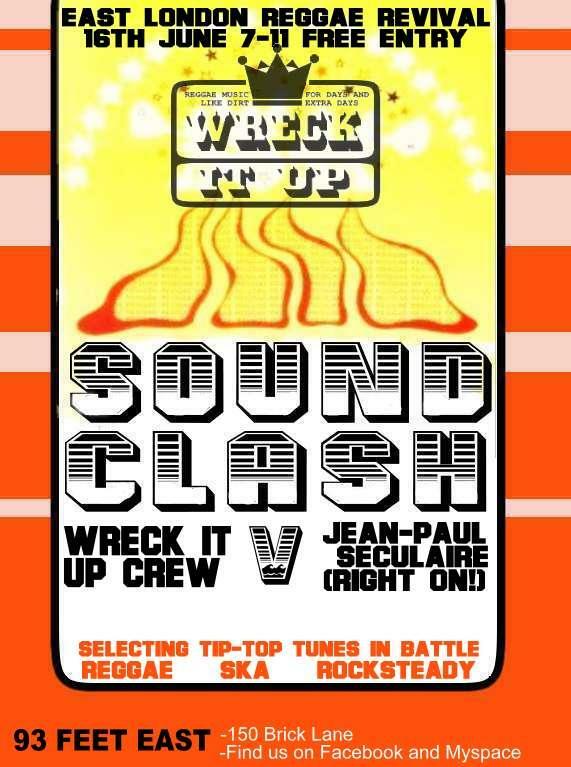 The winner of this clash will be the "People's Choice", so come on down and make some noise! This will be an event to remember. Admission is FREE and the night runs from 7pm - 11pm, being a mid-week session, so get there early as the clash will start promptly. Right On! vs Wreck It Up! Wednesday 16th June. 7pm - 11pm.